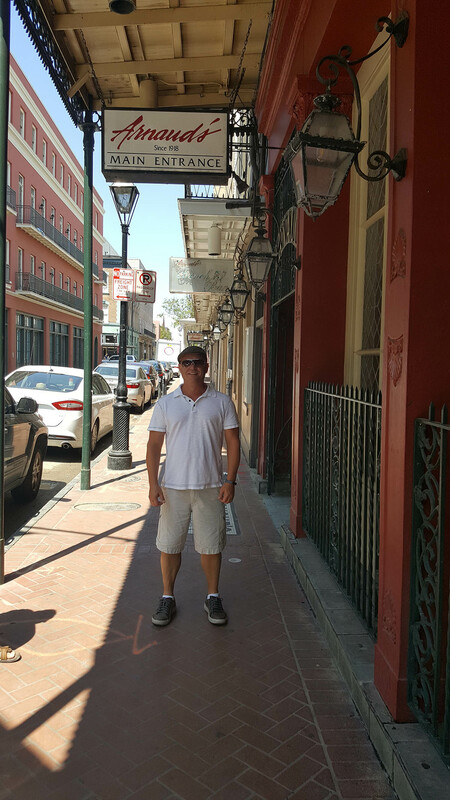 I traveled to New Orleans and enjoyed some of the finest Cajun and Creole cuisine in the world. 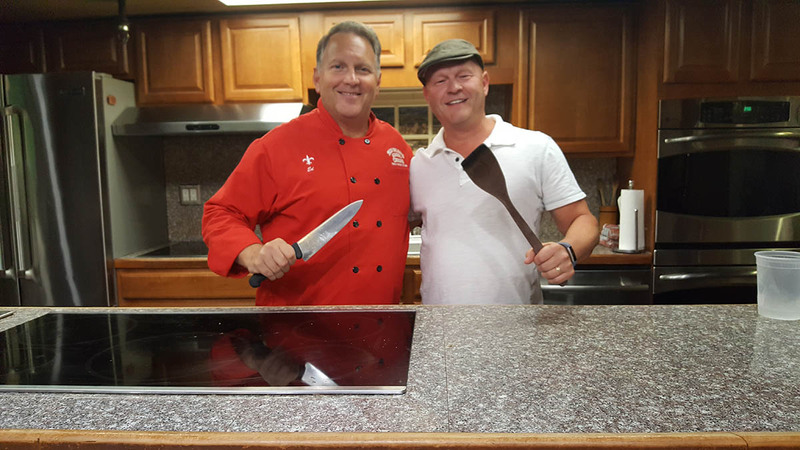 Read about my trip here, about some of the area’s best restaurants and more. I have never been to a city like New Orleans. If you’ve never visited, I encourage you to book your plane tickets now and spend some time there. I visited the city once many years ago, but like many people, I barely remember it. We had booked a cruise that left from the port in New Orleans, so we flew in that Friday, stayed only the evening, then hopped on the ship the following morning. One night is not nearly enough time to experience the wonders New Orleans has to offer. 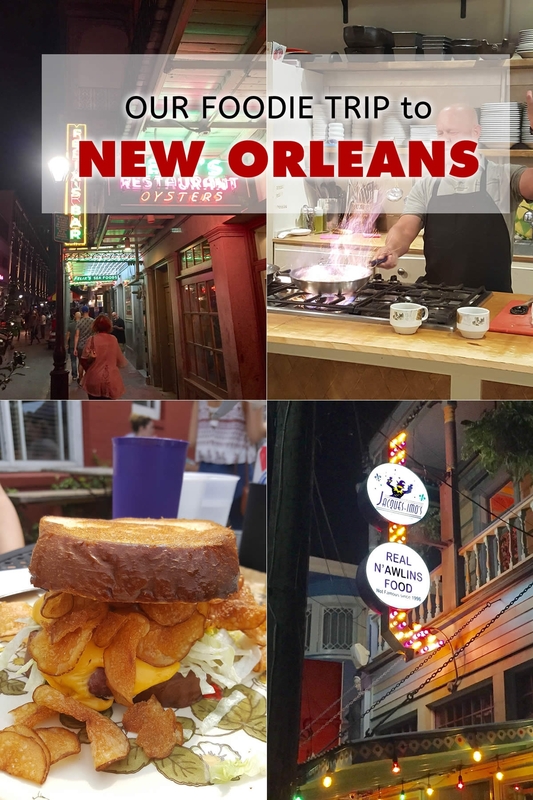 All we did was walk the famous Bourbon Street lined with bar after bar, all the while with drinks in our hands, and while this is absolutely something to experience, there is so much more to New Orleans than Bourbon Street. Namely, the food. As you know by now, Patty and I consider ourselves “foodies” and leapt at the chance to spend a week there. 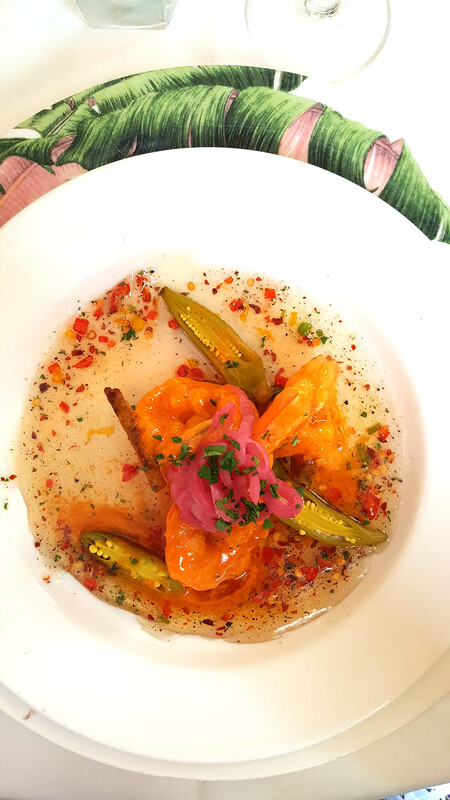 New Orleans is well known for its outstanding Cajun and Creole cuisine that is so incredibly filled with flavor. We found a rental just outside of the French Quarter, which allowed us to walk pretty much anywhere we liked. Lyft, Uber and the famous cable cars carried us everywhere else. We traveled with my wife’s cousin, Erin, and her fiancé, Nate, as they are quite the foodies themselves, and I need to shout out a special THANKS to Erin for her outstanding planning talents. I had never eaten anywhere in New Orleans, so wanted to try anything and everything, which is impossible to do in a week. Erin kindly and aptly researched and scheduled all of our brunches, lunches and dinners, and everything was quite perfect, despite the extra pounds I took home with me. Special shout out, too, to our friends, Matt and Jackie, who came for the weekend part of the trip and ate-ate-ate right along with us. Glad you guys could make it! If you’re planning on visiting New Orleans, I hope this information from our trip helps you make some of your decisions. Since we had only 1 week to visit, we couldn’t eat at every place we wanted to try, but we did our best. There were certain places we would have loved to visit, but alas, had to make hard choices. So where should you eat in New Orleans? Here are the places we visited, and we loved every tasty minute of it! It’s a small restaurant situated outside of the hustle and bustle of the main city, but definitely worth the trip. The menu claims they serve “The Best Fried Chicken” and our group would have to agree, with its spicy, flaky, crispy batter and succulent juices. Do not expect fine dining here, though. It is a small building with tight quarters seating and simple tables and chairs, but no matter. Seriously, get the fried chicken. If there is a line, wait. Highly recommended. 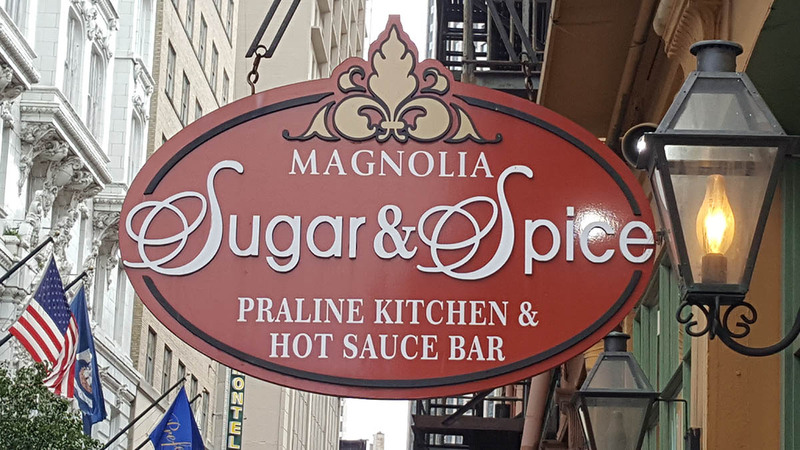 This little place was just down the street from our hotel, so after a night bopping about Bourbon Street, we grabbed a quick bite to eat here. I had the Ferdie Special, which is a po’ boy packed with baked ham, roast beef, debris (the roast beef that falls into the gravy while baking in the oven.) and gravy, served dressed. The sandwich was flavor packed and really hit the spot after a night of drinking. One of the most famous restaurants in the city, known for their freshly made beignets, which are square French doughnuts, and coffee. We visited the main location one morning for early coffee and a bag of beignets, and a satellite location along the Mississippi river in view of the cruise ship port, where a colossal cruise ship waited for its passengers. Great view, and great beignets. Interestingly, many places in New Orleans serve a chicory-coffee blend. Chicory is the roasted and ground root of the chicory plant. It offers a milder flavor to straight coffee, and I found that I liked it very much. 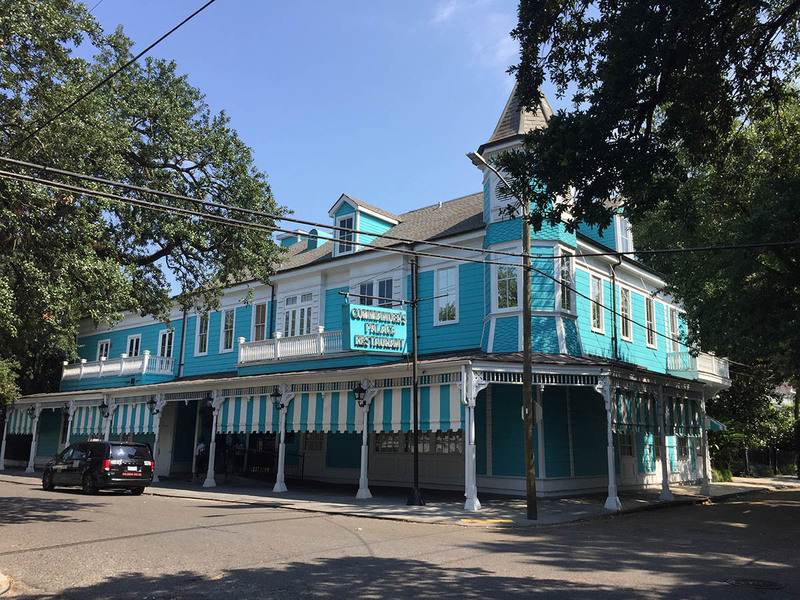 Commander’s Palace is widely famed and has been a New Orleans landmark since 1893. 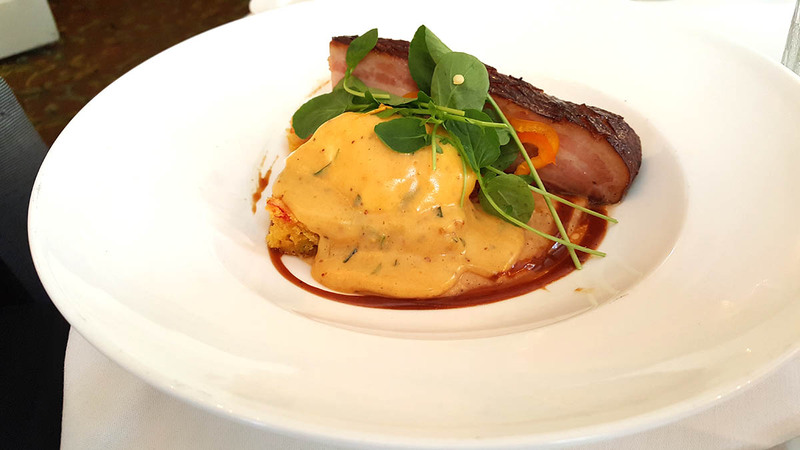 It has achieved 6 James Beard Foundation Awards and has enjoyed a number of well-known chefs like Emeril Lagasse and Paul Prudhomme. 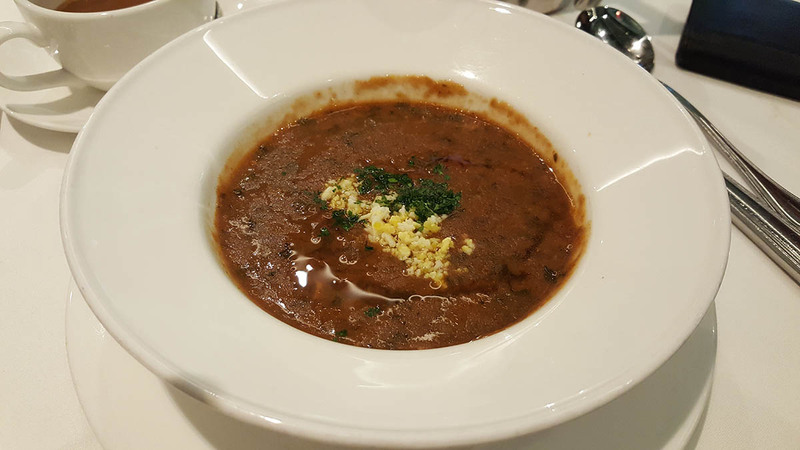 Our group went for brunch where I had my first taste of turtle soup, which I greatly enjoyed for its complex, developed flavor. The cocktails were flowing and my dish of pork belly with egg and cornbread was stunning. The pork belly melted in my mouth. Patty said her shrimp tasso is now in her top 5 best bites of her life. 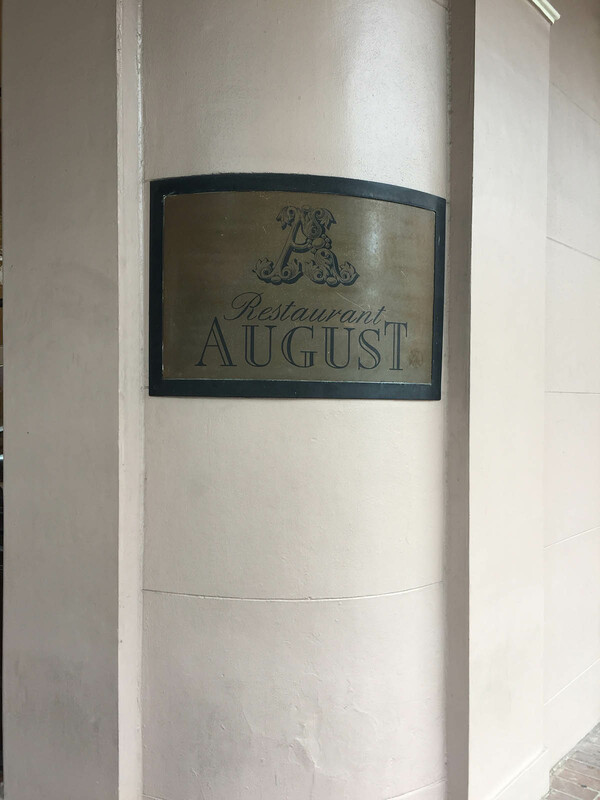 The Oldest French-Creole Fine Dining Restaurant in New Orleans. 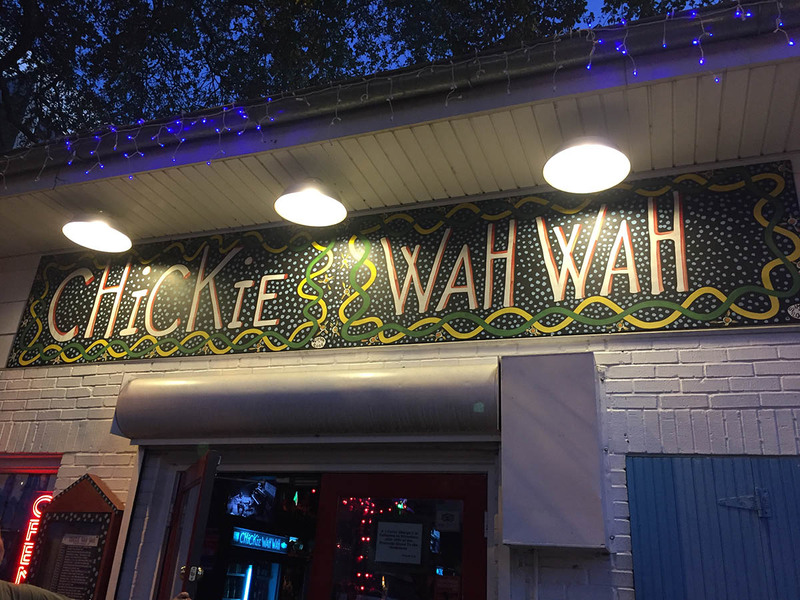 This restaurant has been in New Orleans since 1840 and is still owned and operated by fifth generation relatives of the original founder, Antoine Alciatore. Antione’s son invented the well-known dish “Oysters Rockefeller”, which is so named because of its richness, so of course we had to order some. 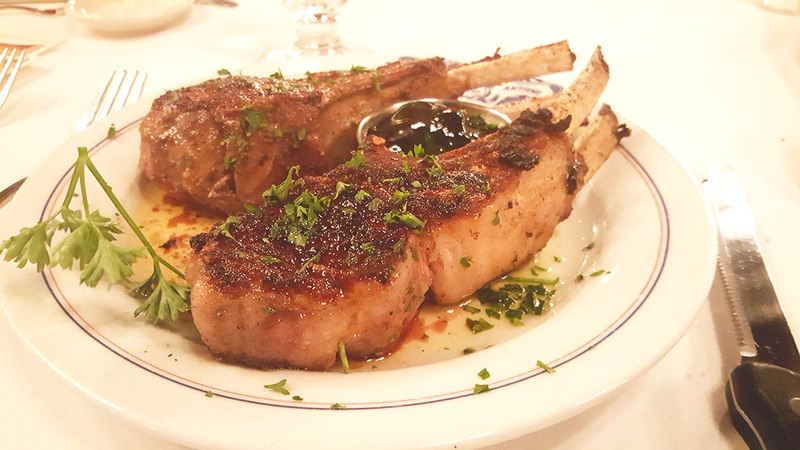 I had one of the best lamb chop dishes ever here and was able to meet our waiter, the fine Mr. Sterling, who has been a waiter in Antoine’s for 50 years. Amazing! 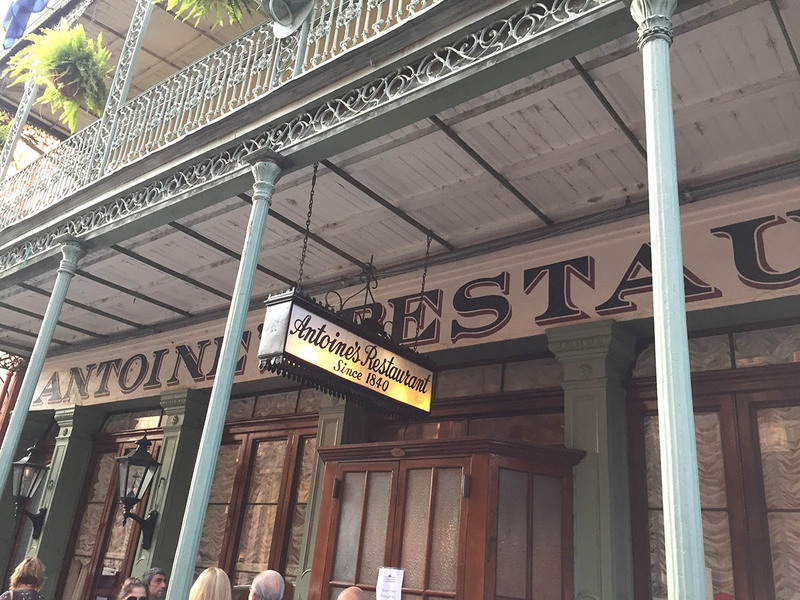 Classic Creole Cuisine in the Heart of the French Quarter since 1918. Our group came to Arnaud’s for their famous jazz brunch and enjoyed the music of the roaming quartet as they played various classic requests. 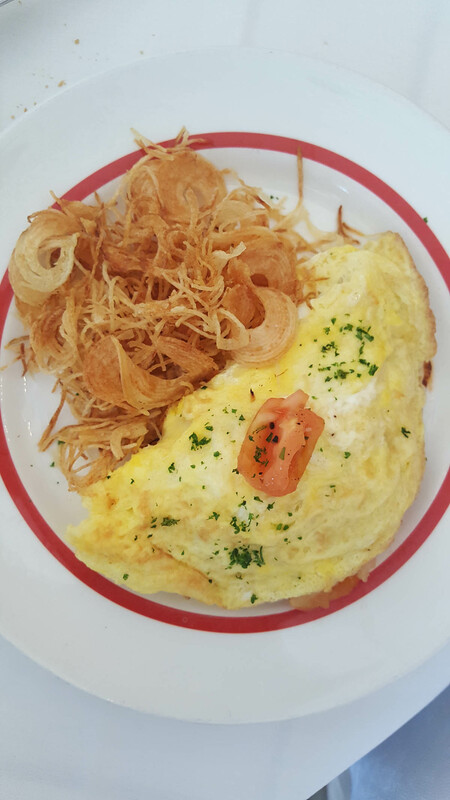 My Omelet Fromage was puffy and cheesy with a mixture of Parmesan, mozzarella and chevre with pancetta, tomatoes and a drizzle of truffle oil. Patty’s Eggs Fauteaux included smoked pompano on an English muffin with poached egg, drizzled with Hollandaise sauce. Everything was delicious and entertaining. 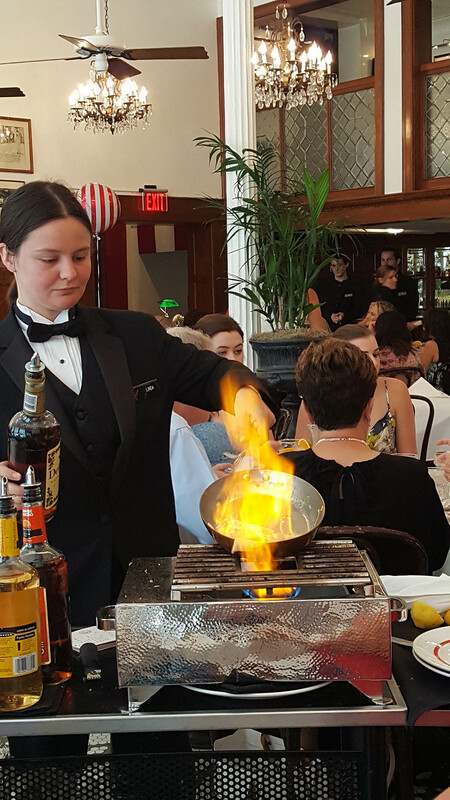 Particularly enjoyable was the Bananas Foster, which is bananas cooked in a mixture of butter, brown sugar, banana liqueur and rum, served with ice cream. So delicious, and don’t forget the Crepes Suzette! 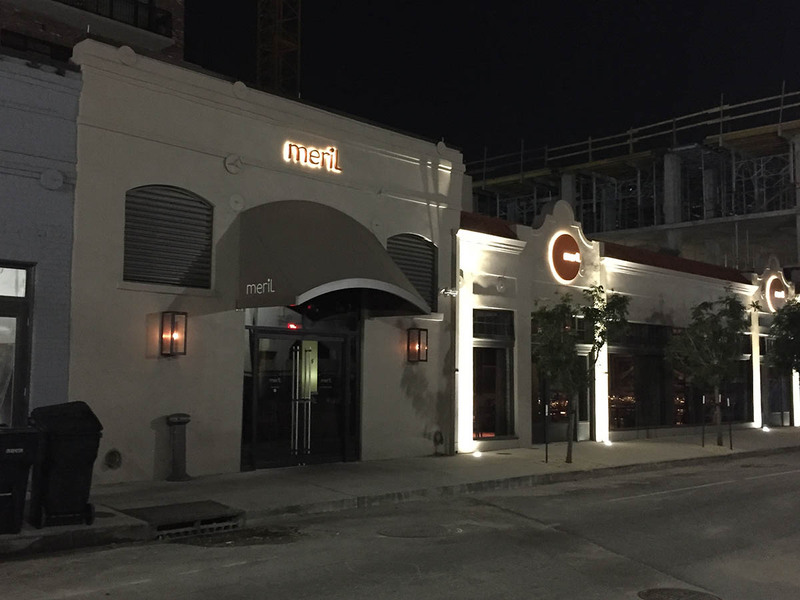 Meril is a newer restaurant in New Orleans, a concept of Chef Emeril Lagasse, arguably the most famous chef from the region. 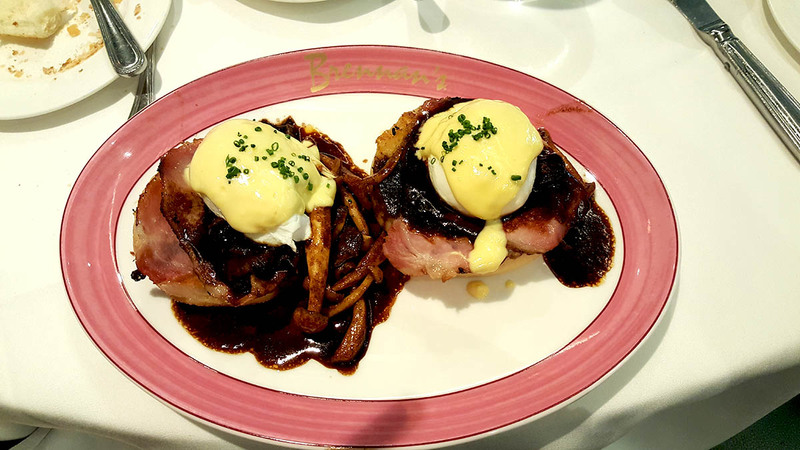 It is named after his daughter and showcases some of Emeril’s favorite dishes that he loves to eat from all over the world. 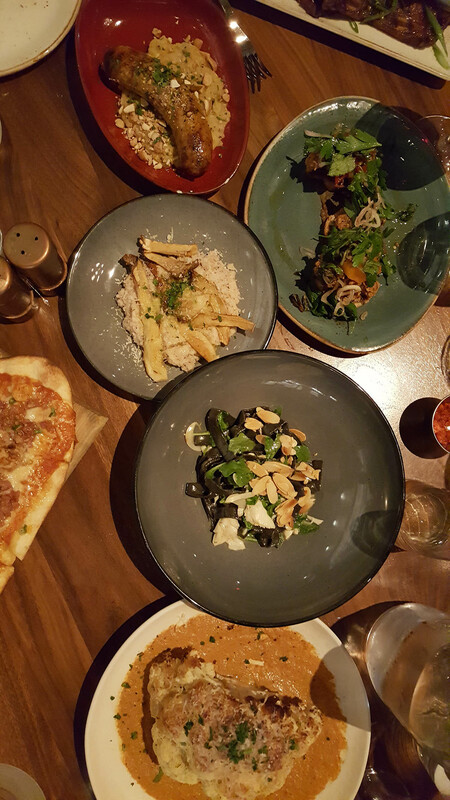 They serve a number of small plates, so our table ordered a collection of them to sample as much as we could. We all agreed each plate delivered with big flavor. Our collective favorite was the flatbread with crawfish and gator sausage, so we wound up ordering another round of it. Great wine selection and many plates to choose from. 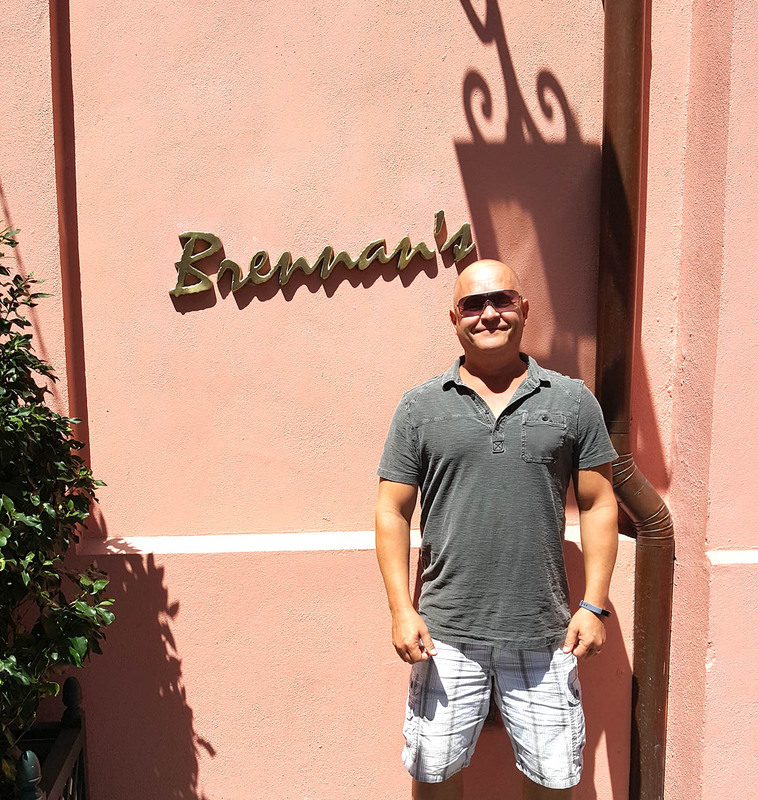 The original Brennan’s opened in 1946 and was recently extensively renovated. The restaurant is huge and elegant, reminiscent of an opulent hotel, with 8 dining rooms. 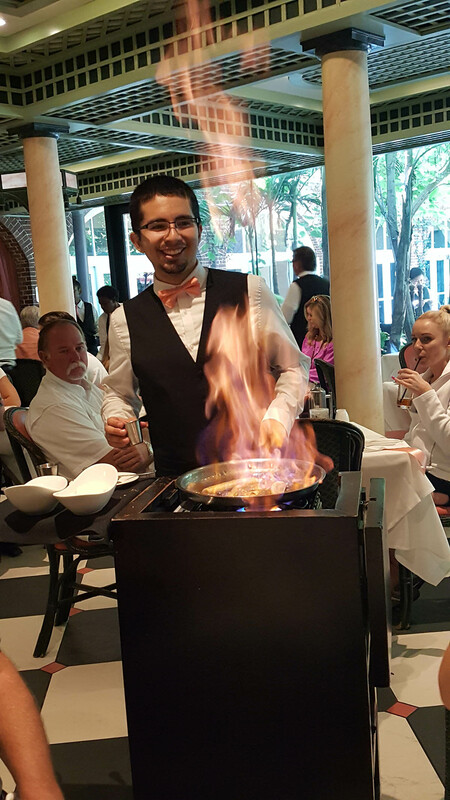 Brennan’s is famous for Bananas Foster, which they invented in 1951 and named it after a man named Foster who ate at Brennan’s 6-7 time a week. What a way to make your mark in history. 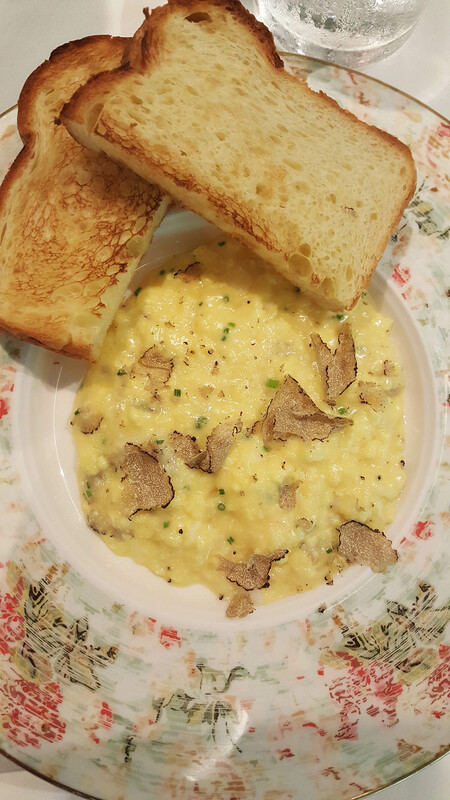 I ordered the soft scramble duck eggs with shaved truffles which was prepared table side. I easily could have eaten another plate full, particularly with the fresh truffles. 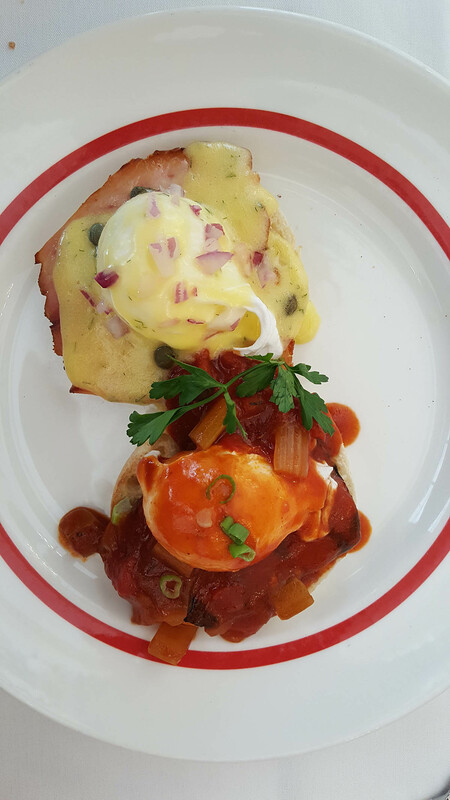 Patty enjoyed the turtle soup and Eggs Hussarde with English muffins, coffee cured bacon, hollandaise and a marchand de vin sauce. 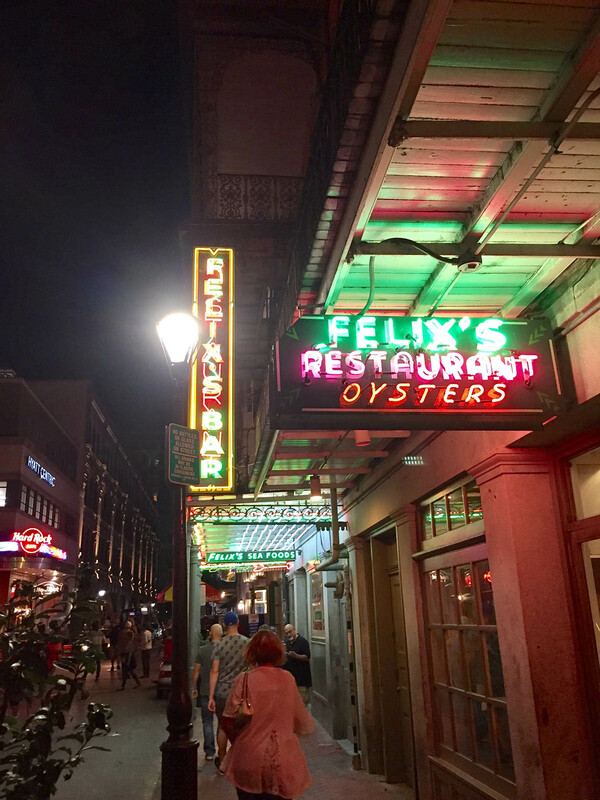 Felix’s has been around since the 1940s, when they built a restaurant where locals could “belly up to the bar” and enjoy fresh oysters shucked before them and served. The restaurant quickly became famous and has been ever since by serving fresh, top quality seafood. The place doesn’t look like much but who cares? 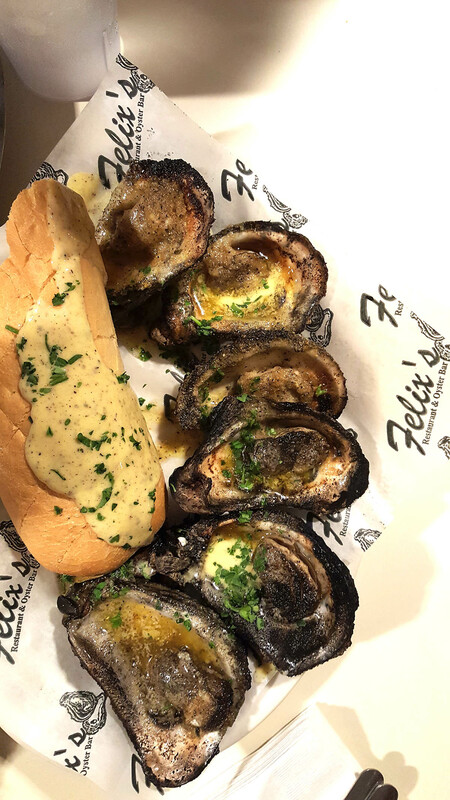 The food is stunning and you flat out MUST order the char grilled oysters with garlic, butter and Parmesan cheese, with their smoky-grill char flavor. Grab yourself a po boy, of which there are MANY to choose. All good. They mix their cocktail sauce with ketchup, horseradish, Worcestershire and lemon juice at the table in a little plastic cup. Go for it! We loved this place. I can see why the locals do as well and have so for so many years. We needed a break from the many brunches and many more benedicts and also exhausted from our whirlwind of eating, so we slept in and chose a nice casual spot for our next meal. We choose well! 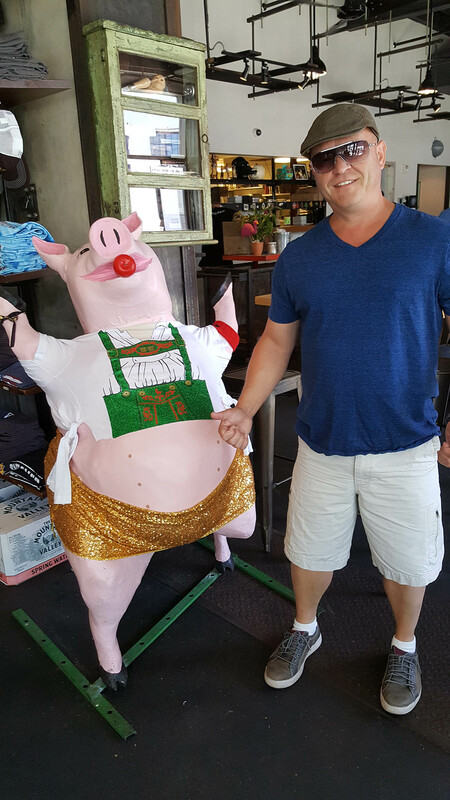 Cochon is a cool place. 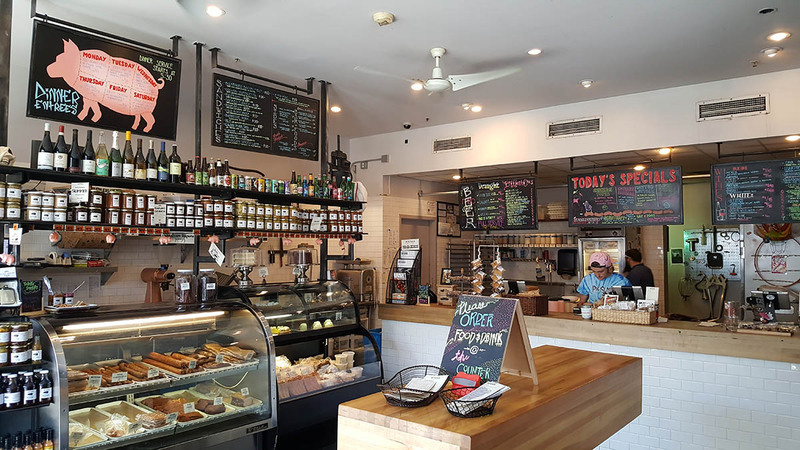 It’s a butcher, sandwich shop and wine bar with an industrial atmosphere and great food. I had an outstanding muffuletta sandwich, and Patty loved her homemade hot link sausage sandwich. 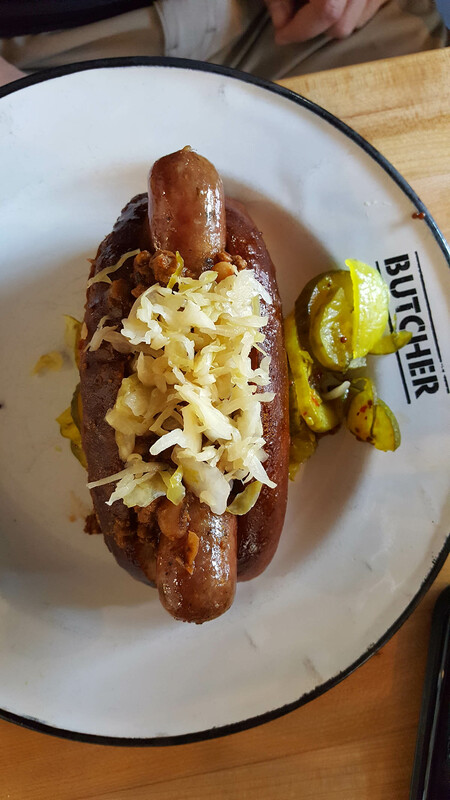 Others had the Cajun pork dog on a pretzel bun, which was well received, along with Brussels sprouts and mac and cheese. By far the craziest place in New Orleans we visited, but also the coolest. 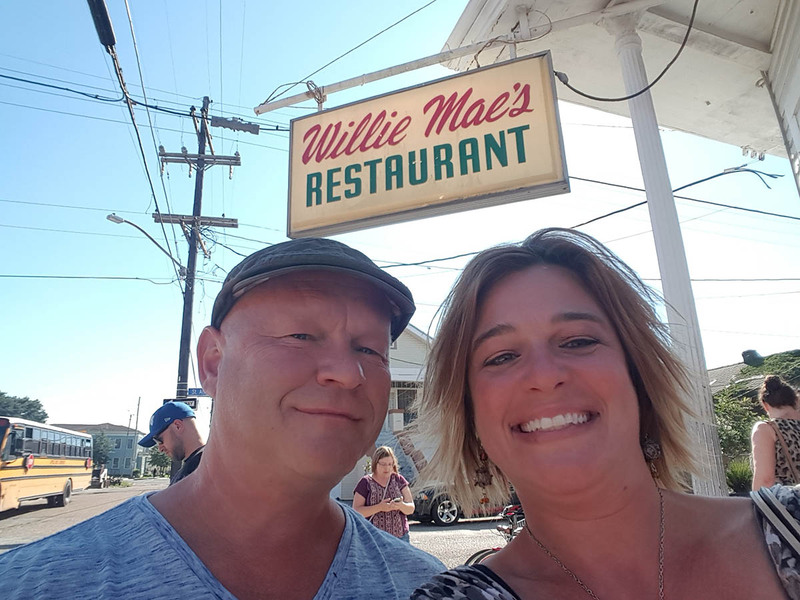 The restaurant opened in 1996 after Jacques Leonardi, a Coast Guard Academy graduate, fell in love with New Orleans. As he studied, he also worked at minimum wage for Chef Paul Prudhomme where he learned the basics of New Orleans style cooking. 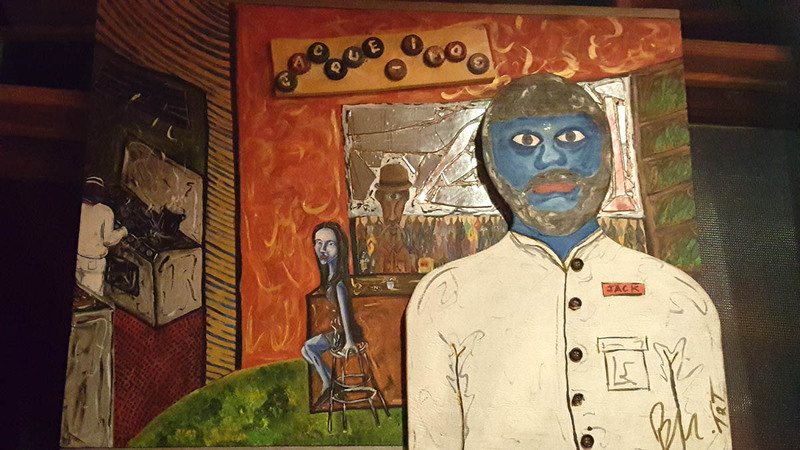 Jacque-Imo’s is the realization of his dream. The restaurant itself is a bit cramped and kitschy and rather wild, but we wouldn’t have it any other way. Grab yourself a $2 can of PBR as you peruse the menu, which will surprise you. The crawfish etouffee was rustic and stellar. Patty asked for hers to be “spicy” and it certainly was. My blackened red fish was perfect and exactly what I wanted, flaky and succulent. The fried chicken and shrimp creole also impressed. Cornbread muffins are served as their table bread and they are oh-so garlicky, and every meal comes with spinach salad with a fried oyster. They also brought out crème brulee for the heck of it. Quite nice! Overall consensus: By far one of the weirdest places we’ve been, yet so, so cool and fun. You walk through the kitchen to get seated. There is only one bathroom and you have to walk through the kitchen service area to use it. Crazy. Loved it. Be sure to make reservations in advance. People wait hours to get in here. We chose this sandwich joint because it was selected by Bon Appetit as the Best New Restaurant of 2017. Turns out its accolades extend to Food and Wine as well as the James Beard Foundation. Walking up, you might not think it’s an award winning restaurant. It’s a small building situated on a non-descript corner. 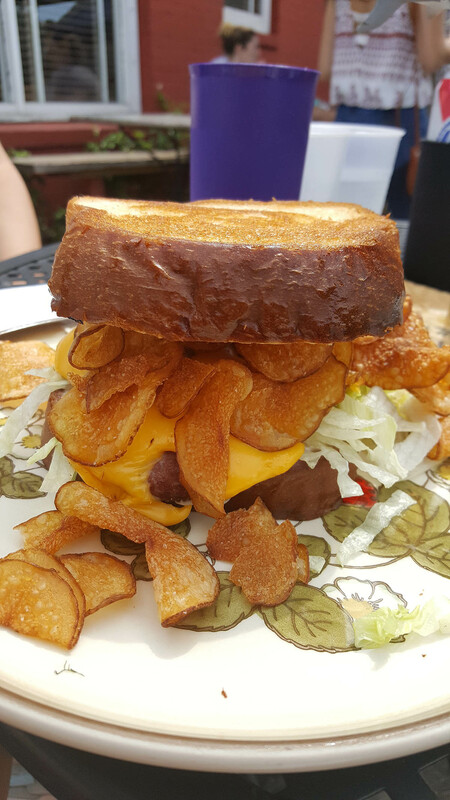 Patty, who swears she will never eat bologna, ordered the fried bologna sandwich with sweet mustard and called it “ridic delicious”. 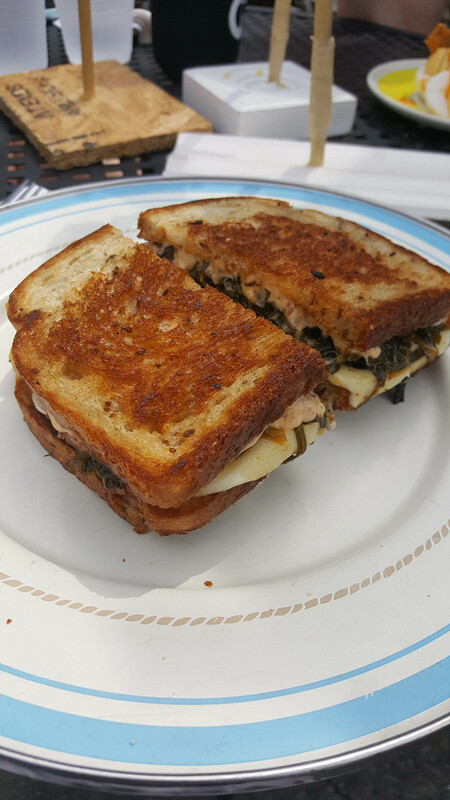 I ordered the collard green melt, which has been raved about, and yes, the raves are all worth it. It is served with a dressing similar to thousand island and coleslaw. 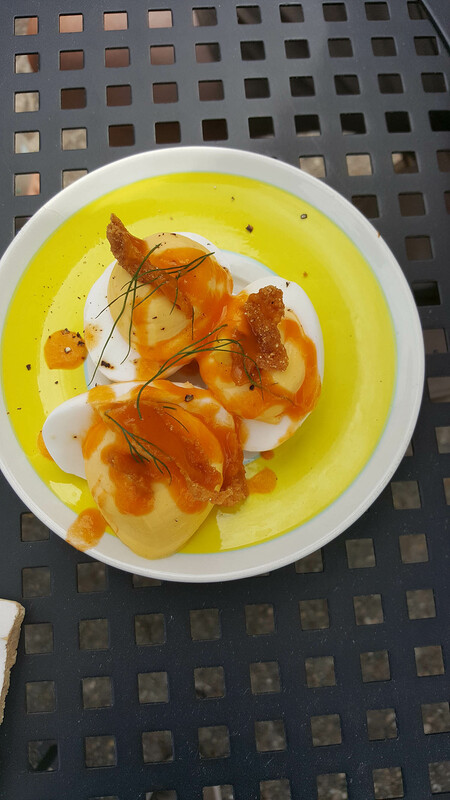 Try the deviled eggs with crispy chicken skin. This is Chef John Besh’s flagship restaurant with a focus on contemporary French-Creole cuisine. They’re located in the Central Business District and are known for their excellent fine dining. On our food tour, our foodie tour guide said she’d never had a better fine dining experience, and I would have to agree. Truly, a phenomenal fine dining experience. 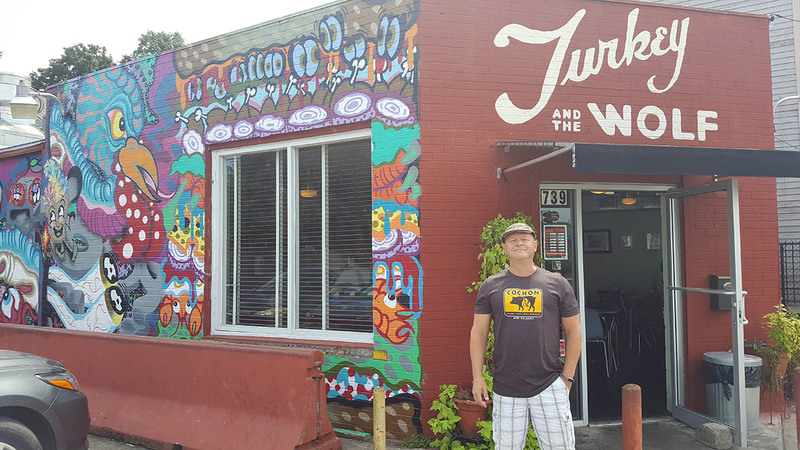 This is a restaurant with an incredible civil rights history. Initially, it was a sandwich shop and lottery ticket outlet, but eventually blossomed into a respected family restaurant in 1941. It was founded by Emily and Dooky Chase, Sr., and soon became the meeting place for music and entertainment, civil rights, and culture in New Orleans. Our Lyft driver had stories about Dooky from when he was kid and how he met Richard Pryor there. Mr. Chase was a highly popular local. We arrived and our group enjoyed a buffet of classic southern favorites, which included red beans and rice, scalloped potatoes, pasta, hot sausage, fried chicken, liver, cabbage, and mixed veggies. Everyone’s favorite was the hot sausage. The fried chicken was super juicy and nicely seasoned with a good coat of breading. We loved the light corn chowder, and the peach cobbler was a nice finish to the meal. They’re slogan is “put a smile on your face”. It sure did! 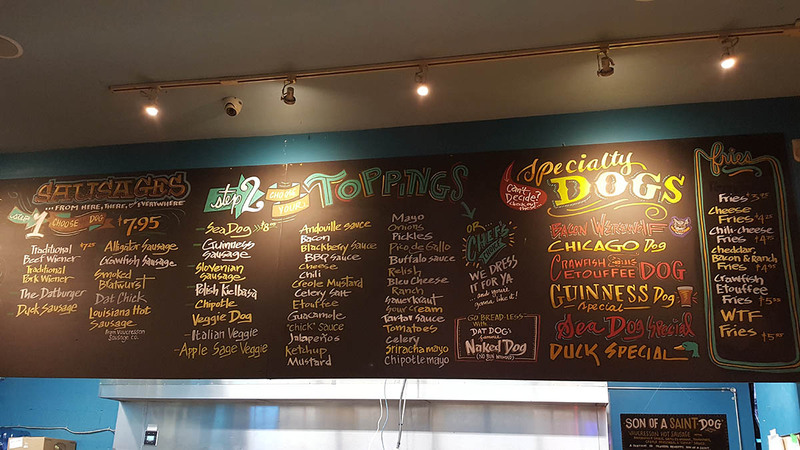 Dat Dog opened in 2011, post-Katrina, in a small building with the idea that hot dogs can make you happy. But! These are no ordinary hot dogs. These guys have a very creative menu that surprised all of us. The place is bright and colorful and very fun. 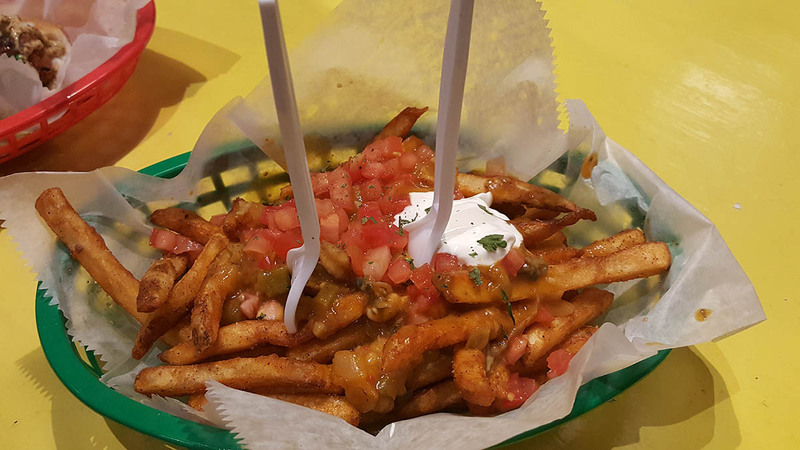 We opened with house made French fries that were smothered in crawfish etouffee. DUDE! So good. You basically choose your sausage type and whatever fixins you desire. The crawfish sausage was nice and spicy with a subtle burn, and the hot sausage delivered some good level of heat for me. 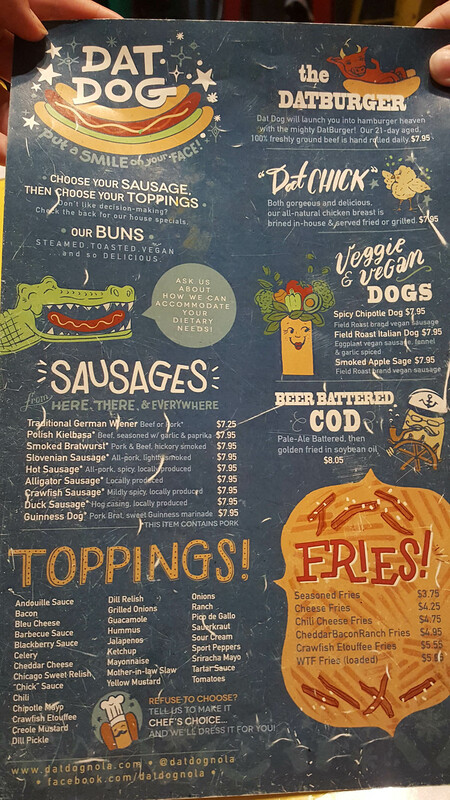 They have gator sausage, duck sausage, Slovenia sausage… you get the idea. Definitely worth a visit. Patty is a huge fan of sausages so when she realized how big New Orleans was for hot sausage, she ordered it everywhere. This was our last meal of the week and she was beyond delighted at this diverse sausage menu. They also have burger and vegetarian options. 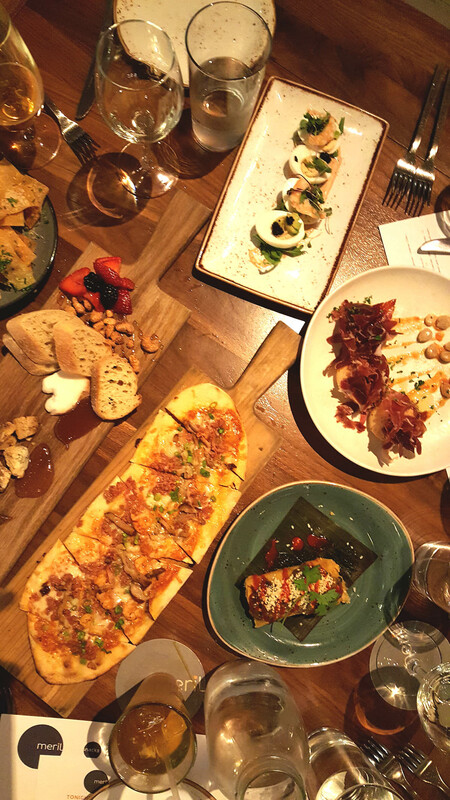 Aside from eating in outstanding restaurants, from fine dining to hole-in-the-wall joints, we also enjoyed a number of food-related experiences. I wish I hadn’t scheduled this immediately after a brunch, but it was still highly enjoyable. We learned a lot of history and were taken to a number of famous places. The tour included a visit to a Praline shop where we learned “Praline” is a famous last name, pronounced “prah-leen”, not “pray-leen”. We were reminded of this multiple times. Get your pronunciations straight, people! We were taken to Twojague’s Bar (http://www.tujaguesrestaurant.com) which has been opened since 1856. They’re famous not only for their beef brisket (which is super tender), but also for inventing the wildly popular Grasshopper cocktail. We visited SoBou (https://www.sobounola.com), named for “South of Bourbon”, and enjoyed some outstanding cracklin’, boudine balls, which are made with rice and chicken and pork livers, served with creole mustard. The sweet potato beignets were eye opening. Wow! 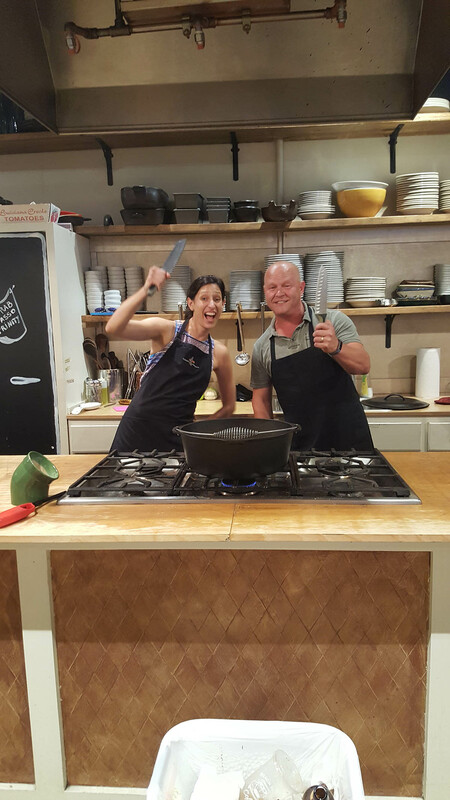 I took 2 cooking classes while visiting and enjoyed them both. One was simply a demo class, while the other was hands on. 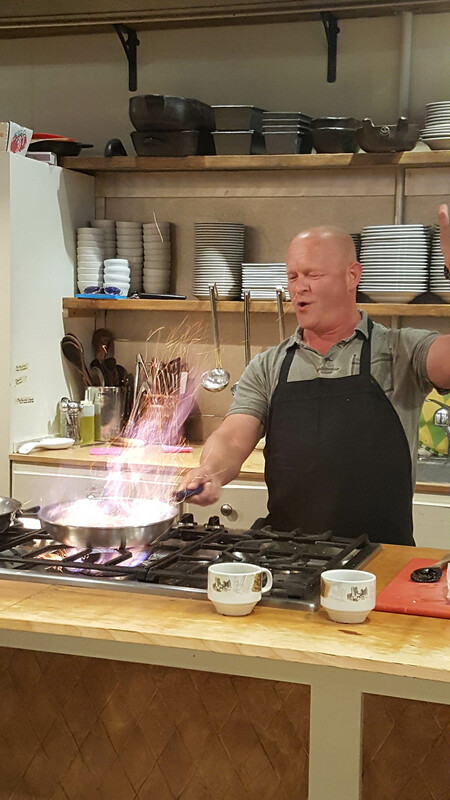 The first was the New Orleans School of Cooking (https://www.neworleansschoolofcooking.com). We watched the chef prepare a Corn and Crab Bisque, Chicken Etouffee, and Pralines. The second was Crescent City Cooks (http://www.crescentcitycooks.com/) where I prepared Seafood Gumbo, Chicken Fricassee, and Bananas Foster. Super fun! 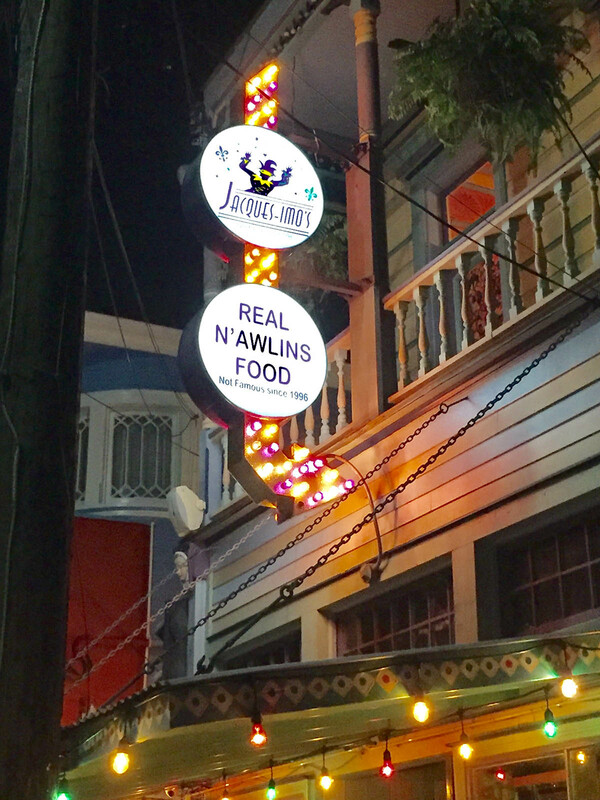 I asked a lot of questions and learned a great deal about local, true New Orleans cooking. Most importantly, I learned that it really doesn’t matter what type of fat you use to make your roux. You can use butter, oil or lard, and opinions will vary from chef to chef. Also, the darkness of your roux is another personal preference. Some dishes ask for a blonde roux, but that doesn’t mean you can’t use a dark roux, and vice versa. If you enjoy the final result, then you’re doing it right. I asked what constitutes “Cajun Seasonings” and the chef’s answer was “whatever your mamma taught you.” Fair enough! This is the subject of another post for sure. 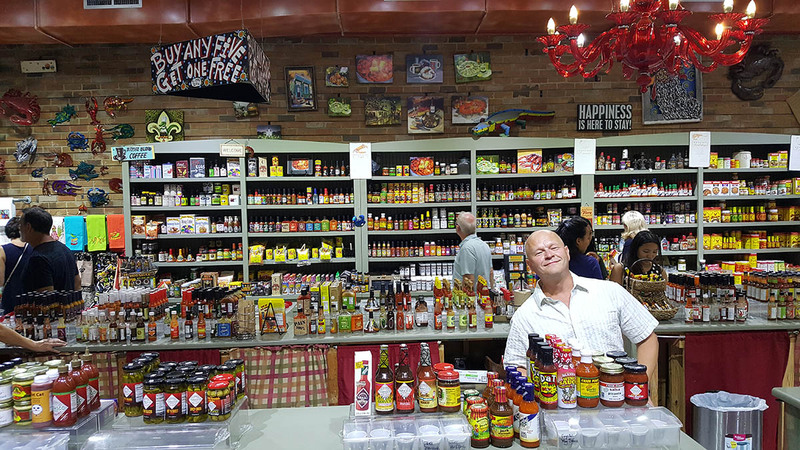 There ARE basic ingredients to both Cajun and Creole seasonings, but after that, you are only limited by your own creativity. I learned you can freeze roux to save time later making your gumbos, etouffees and fricassees. You can also freeze it after you’ve added your holy trinity. Yes! Time saver! What is the Holy Trinity? French cuisine uses a “Mirepoix”, which is a mixture of diced carrot, onion and celery to flavor their dishes. Since carrots do not grow well in the Louisiana soil, they instead use bell pepper, onion and celery, which is the Holy Trinity. Garlic is also often included as well. Learn more about the Cajun Holy Trinity here. “New Orleans” is pronounced “New OR-linz”, not “New Or-LEENZ”. A tour guide told us famous local John Goodman said it best. “There is nothing LEAN about New Orleans”. 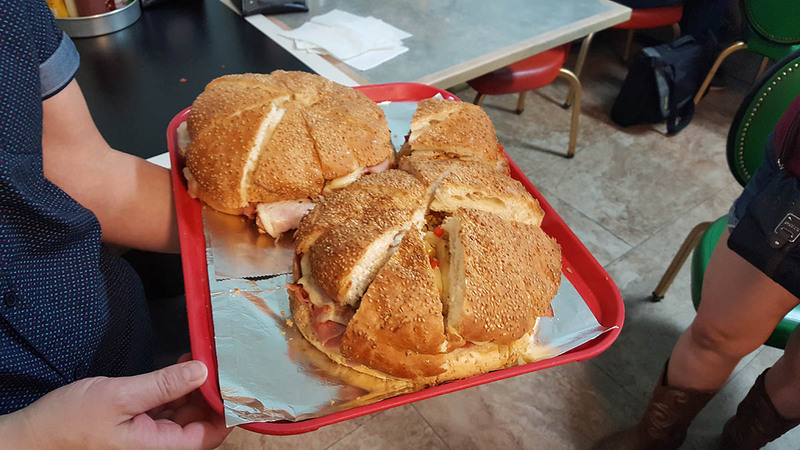 Muffuletta literally translates to “little glove” and were originally meant to serve 4 people. It’s a classic local sandwich made with marinated olive salad, layers of mortadella, salami, mozzarella, ham, provolone cheese. I had a couple of them while visiting the city. Love them. Cocktails. New Orleans is very much a town of classic cocktails. You have drink options with different types of bitters, gins, whiskies and bourbons. If you love classic cocktails like the Sazerac, you’ll love this town. Hot Sauce. 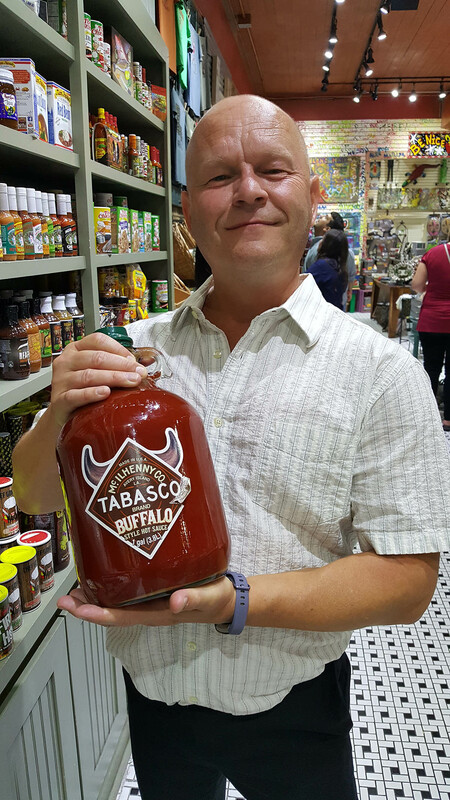 The biggest hot sauce I saw was Crystal’s hot sauce, which is very much like Tabasco in flavor and consistency, though Tabasco was also quite prevalent. 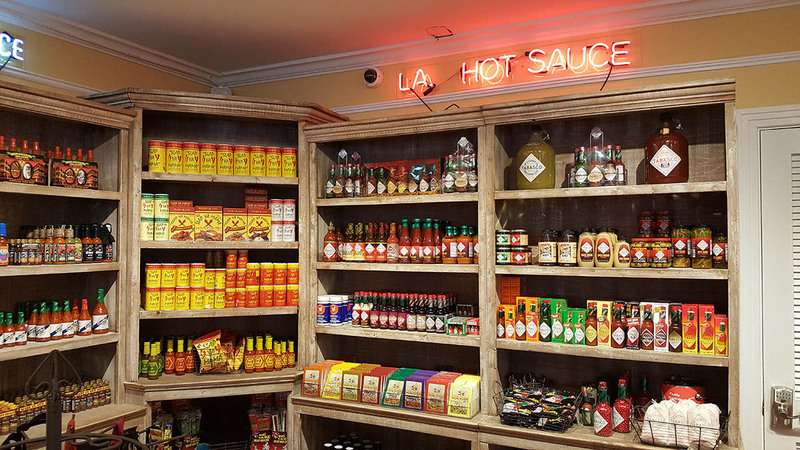 It is very much a hot sauce town. You’ll find it everywhere. Spicy Food. Cajun and Creole food is known for its spiciness, but not for its heat. There is a difference. “Spicy” doesn’t always mean “hot”. It really just means highly seasoned with bold, flavorful ingredients, so if you’re expecting big heat, NOPE. Expect big flavor, though. Louisiana cooking is some of the best around. Cracklin’. Cracklin’ is crispy fried pork skin and it’s delicious. We tried some with maple syrup and were shocked at how good it was. Definitely a must try. Music! Let us not forget that New Orleans has a HUGE music scene. 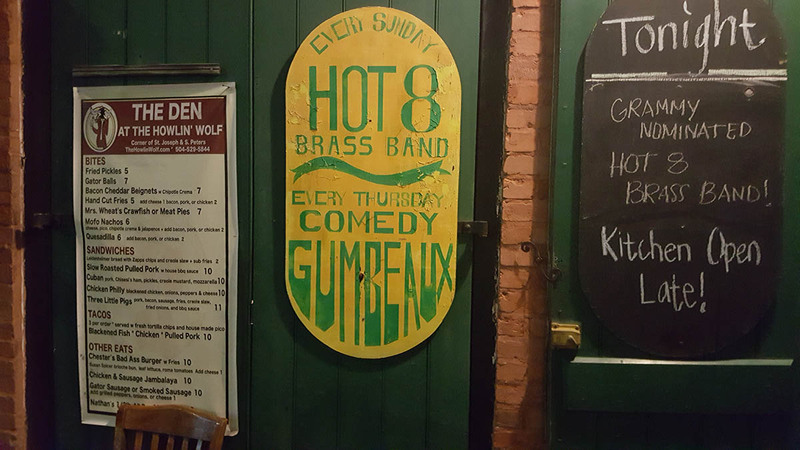 We saw “Hot 8 Brass Band” at the Howlin’ Wolf, “Rebirth” at the Maple Leaf Bar and Grammy award winning pianist Jon Cleary at Chickie Wah Wah, among other great musicians, including some phenomenal artists at Preservation Hall. I hope this helps you enjoy New Orleans! 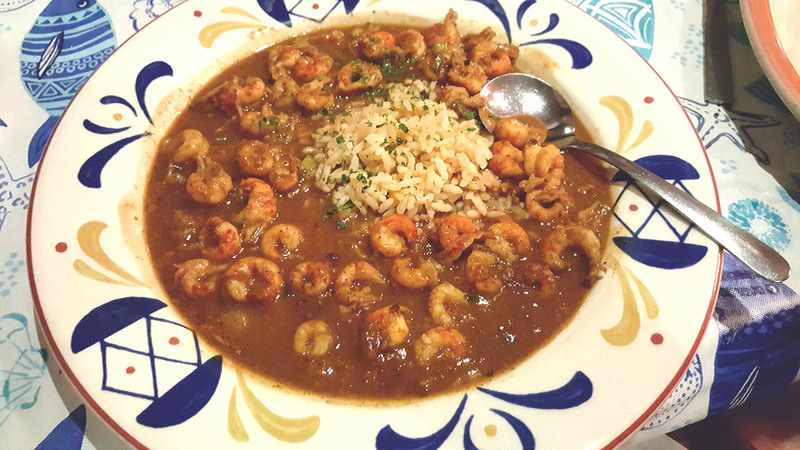 I can’t wait to visit there again for some more outstanding Cajun and Creole cuisine! That looks like a heck of a trip. My wifeand I were down there this past summer and really enjoyed the food. Though I wish I could have gone to all the restaurants you checked out! What a great tour. I love New Orleans like no place else. And, of course, you could go back for the same amount of time and visit an equal number of different great places. AND, Hot 8, Rebirth and Jon Cleary at Chicky Wah Wahs.! Thanks for your great blog!